Wood is one of the most versatile anddemanded construction materials, but has some shortcomings, the most important of which - the fragility due to improper or careless handling. 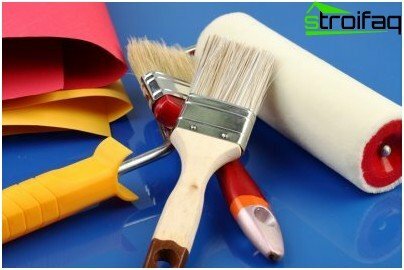 For this reason, it is important to carefully prepare wooden surfaces for painting and coloring to choose quality materials. 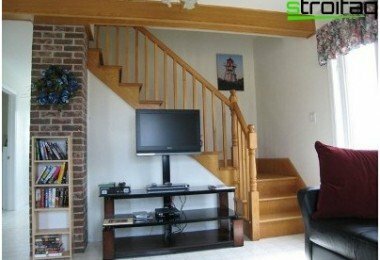 How to paint the stairs in the house - paint or varnish? Depending on the type of wood and its qualitychoosing paint or varnish for coating wood surfaces. Luck will stress the beauty of natural materials, but only if the ladder for the manufacture of wood was taken of high quality, without defects. 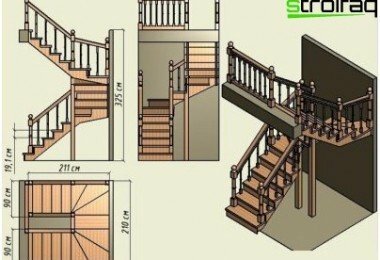 So as usual, and manufacturers, and customers believe that the main characteristic of the staircase - it's strength and durability, the aesthetic component overshadowed. Sometimes unpainted stairs may have visual deficiencies, so it makes sense to hide them under a layer of paint. 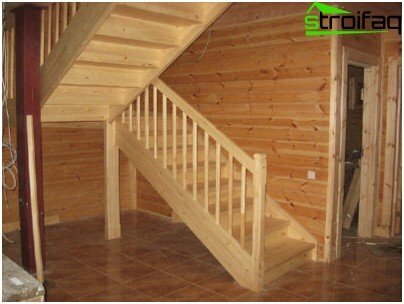 If we want to emphasize the advantages of wood, this is the time of the pre-negotiate with the manufacturer, and then ladder, lacquered, will decorate the house. if you decided to paint a ladder with paint, it is considered to be of higher quality paint based on natural linseed oil, although for internal stairs should be fine and paints based on synthetic varnish. Before you paint the wooden ladder,It is necessary to accurately determine the answer to the question - will there be a ladder used during the painting process. 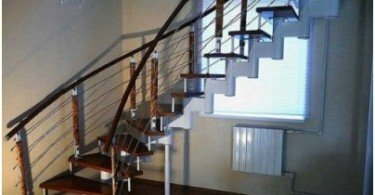 Ideally, it is better not to use it to complete the drying, but this possibility is not always available, and in such cases professionals recommend to paint the stairs two steps. This tricky maneuver will not restrict movement around the house, but in this case the ladder painting is automatically divided into two stages and the time for complete drying is doubled. Also in this case it is harder to put on a surface of steps pattern or ornament with a stencil, as sometimes it is impossible successfully combine its elements, and the people living in the house, can forget that the ladder is colored and come exactly on another, wet stage . Another important detail - how to paintladder: a disassembled or assembled. If the house is new and has not yet mounted the ladder, it is better to paint it before assembly, so you can effortlessly paint over the places, which after installation will be very difficult to reach. masking tape, through which paintingwooden staircase will be done more carefully. 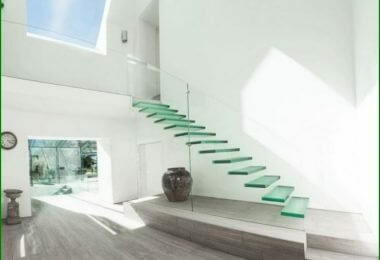 In addition, the masking tape can be used to create original designs, which will give the staircase an unusual appearance. 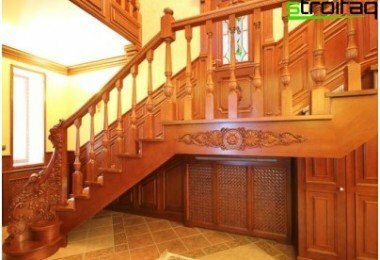 Traditional, which recommends to select the colorflooring and stairs a few shades darker than the main color scheme room, trying to avoid too dark shades and gloomy colors. A common color for flooring and stairs long considered tea with all the variety of shades. 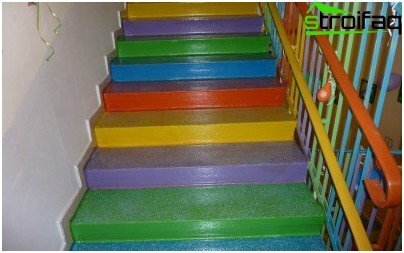 design that allows you to safelyexperiment with colors, shades and decorated with painting and decorating the stairs. It all depends on the individual preferences of the house and family members of the owner. Most often, the original idea for the painting of ladders embodied in nurseries and playrooms. Paint can be both along and across the elementsstairs, not forgetting that the finishing touches have to be applied precisely along the wood structure - this will ensure the high quality of painting and an attractive surface appearance. 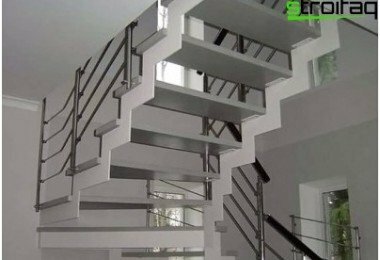 After completion of the work can only waitthe moment when the painted staircase can be used. Practice shows that to obtain a stable satisfactory result is better slightly increase the drying time specified by the manufacturer, as some factors (humidity, temperature, etc. in the room.) May adversely affect the rate at which the paint dries.